In this week’s spotlight, Ship Efficiency Review presents in-depth insight into the journey of Ecochlor’s ballast water treatment system towards United States Coast Guard Type Approval. The land-based and on-board tests have been completed for the system, the final stage of environmental testing remains and Ecochlor will submit its application for to the USCG for Type Approval in the next few months. This feature offers valuable insight into the process, the timeframes and the challenges. The European Maritime Safety Agency has published a report that discusses the potential of ethanol and methanol as marine fuels. GAC EnvironHull’s Hullwiper is to become an available service for ships berthing at the Port of Rotterdam. The design and technical aspects of the world’s first liquefied natural gas (LNG)-powered icebreaker were revealed this week at the CIMAC World Congress. ABB Turbocharging has presented its first dedicated turbocharger for marine auxiliary applications at the CIMAC Congress 2016 held in Helsinki, Finland. Following the success of the LNGreen concept, a joint industry development project designed to create a state-of-the-art next generation liquefied natural gas (LNG) carrier, DNV GL has announced that a follow-up project will commence, building on the efficiency and cost effectiveness of the initial project. Liberia has become the first flag State to participate in the independent Green Award scheme and will offer a 3% tonnage tax discount annually to all Liberian flagged vessels that are Green Award certified. An official ceremony marking the Liberian Registry / Green Award initiative took place on 8 June. ABS has released a comprehensive software solution that is designed to increase ship efficiency, reduce costs and facilitate emissions reporting and compliance. The ABS Nautical Systems Vessel Performance tool uses a ship-specific performance model that tracks key performance indicators (KPIs). 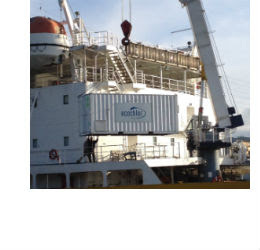 The VTT Technical Research Centre of Finland, the Finnish Meteorological Institute, Tampere University of Technology and the University of Turku have joined forces in an international project to try to make the measurement of black carbon emissions from shipping more reliable. A new online platform for the Wärtsilä Encyclopedia of Marine Technology, formerly known as the Encyclopedia of Ship Technology, is to be launched during the CIMAC World Congress forum held in Helsinki, Finland from June 6 to 10. Winterhur Gas & Diesel (WinGD) has unveiled its latest two-stroke engine as well its other technologies and strategies that are being developed for efficient shipping at the CIMAC 2016 congress held this week in Helsinki, Finland.